Ladies and Gentlemen, without further ado I'd like to bring you the best toy of 2010. Available exclusively in 1,000 won shops in Jeonju, this beautifully crafted whimsical device is sure to please any small human in your life. So here it is, please give a warm welcome to the Miraculous Writing Board! Made from finest quality plastic and cardboard, this incredible toy is designed to satisfy the needs of the child on the go. Forget your Galaxy Tab or iPad, for the Miraculous Writing Board has many more cool and unique features for the technologically savvy. 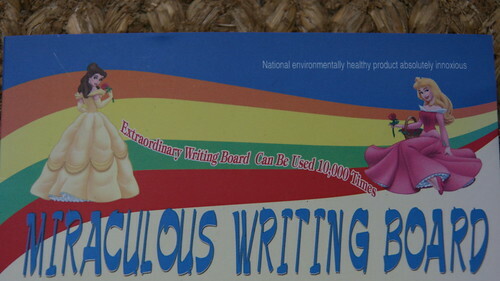 This extraordinary writing board can be used not once, not twice, but 10,000 times. A feat of paper engineering. And those boffins in China guarantee it is a national environmentally healthy product absolutely innoxious. While others may suffer from numerous electronic tablet afflictions, your child will be guaranteed safe with the Miraculous Writing Board. But wait, there's more! 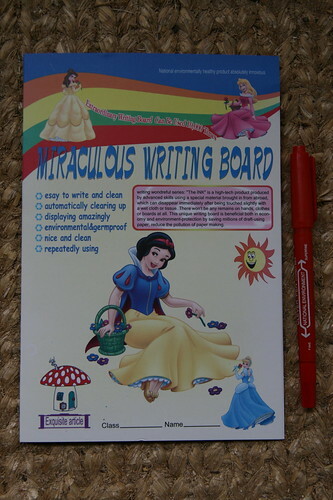 The Miraculous Writing Board is esay to write and clean and is perfectly suitable for repeatedly using. It also will be displaying amazingly once you start using this fabulous toy. 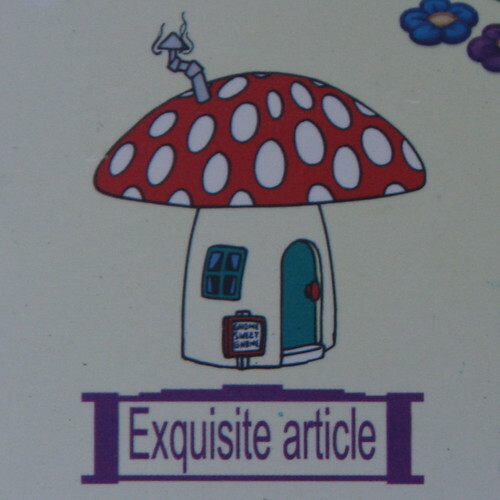 I think we can safely say that the Miraculous Writing Board is indeed an Exquisite article! The Miraculous Writing Board is covered with beautiful illustrations of never before seen Princesses, allowing your little boy or girl to let their imaginations soar (All similarities to any American animated characters are purely coincidental). With the latest technological advancements, the Miraculous Writing Board will help your child learn the Alphabet in both lower and upper case, as well as letting them in on the mysterious secrets of multiplication, division, addition and subtraction. 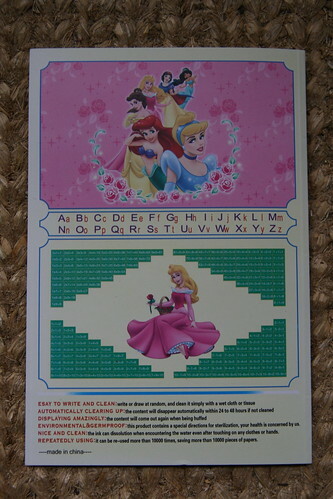 With esay to use instructions, Miracle Writing Board is suitable for all the family. Write or draw at random, and clean it simply with a wet cloth or tissue. The content will disappear automatically within 24 to 48 hours if not cleaned and the content will come out again when being huffed. 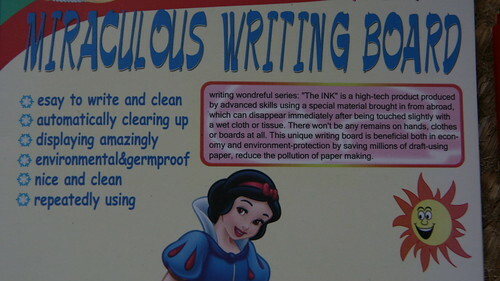 Miraculous Writing Board's patented huffing technology guarantees that you'll be using our product again and again (10,000 times to be precise), and our ink can dissolution when encountering the water even after touching on any clothes or hands. As a token of our appreciation we'll even give you your very own Miraculous Writing Board stylus. Simply, remove the caps and choose between fine or superfine (for very detailed work). Tic Tac Toe will never be the same, once you've used the Miraculous Writing Board. As we enter 2011 why not take the time to purchase a Miraculous Writing Board for a friend, family member or colleague. This inexpensive alternative to recent tablet technology will have you and your fellow humans amazed and enthralled. It's not too late to send me one of these as a Christmas present. By the way, Paul - did you know that we're updating our subtitled movies post every two days? If only I could, I only have the one and it's already used. Plus at 1,000 won a pop, I'm not sure if I can afford it in these desperate times! I'm glad that you're updating every couple of days. It's a very useful service for those of us who are cinematically inclined.